Go to this link for the Flickr Group for this ornament swap. Who wants to swap ornaments? This is it, the ornament swap I’ve been thinking about since last December! I am a very “in the moment” kind of person, so I usually think of gifts I want to make the week of the actual holiday. This year, I thought it would be fun to host an ornament exchange in July. I love making ornaments! I used to exchange handmade ornaments every single December. I used to belong to a group of 12 women that would exchange ornaments and holiday decorations, which meant we each had to make 12 of something and bring our goods to a holiday party to exchange. It was a fun experience, but I got burned out on making assembly-line ornaments. Last year, I participated in one ornament exchange with Rebecka which was quite fun. She sent me this beautiful fabric cracker ornament, which I use as a little candy dish at my desk. 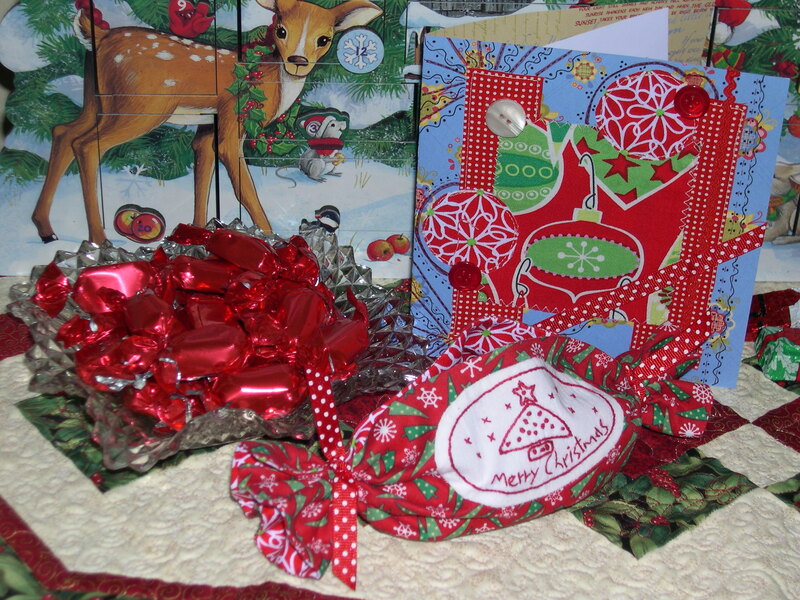 She also included the prettiest patchwork card and fabulous chocolates. The best part of our exchange was becoming friends. I also asked my friend Cheryl to exchange ornaments. 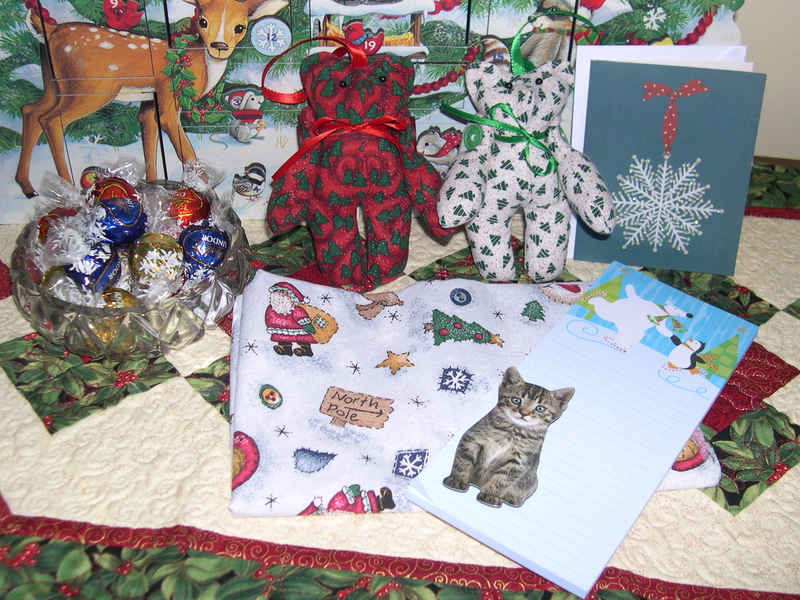 She sent me this adorable set of bears she made, along with a stationary pad, winter fabric, a kitty magnet, and a bag of chocolates. If you are looking for ideas and suggestions for an ornament to make, I included some pictures above of a variety I have made over the years. 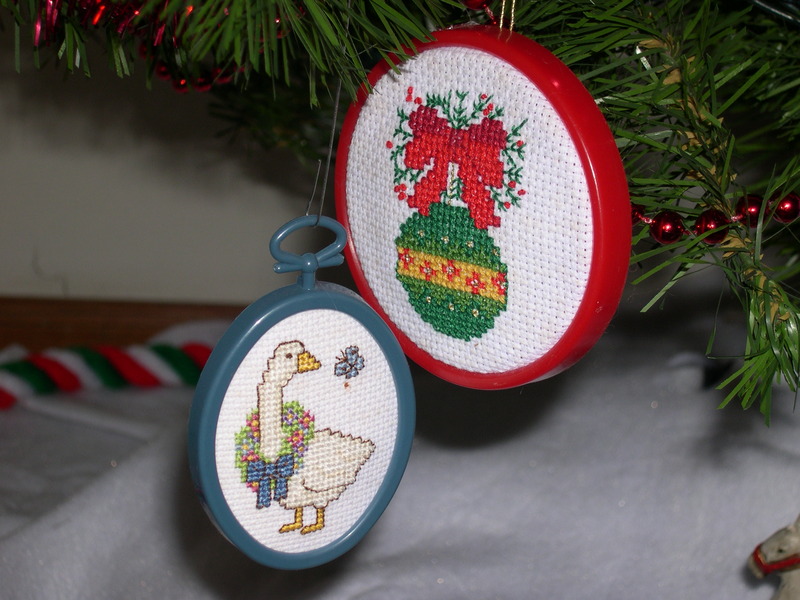 You could also do a search on Google or Flickr for handmade ornaments. Freshly Blended has a couple flickr pools from years past that you could browse through. If you knit, you could make mini stockings or sweaters (see photo above). These are my all-time favorite ornaments to make. The mini mittens are from an old magazine, and the stocking and sweater are from Joelle’s book Last Minute Knitted Gifts. If you crochet, you could make snowflakes or stars. If you sew, you could make a mini 9-patch quilt (see photo above), a mini present or a mini stocking. 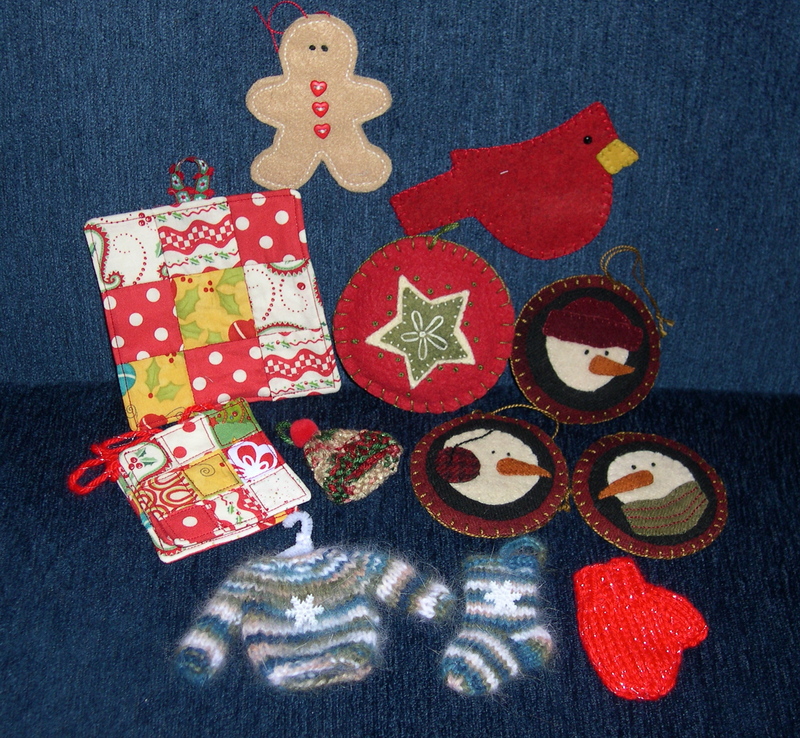 If you like to work with felt, you could use a cookie cutter to cut out two matching shapes, embellish as desired, sandwich the two sides, and do a blanket stitch around the edges to hide the backsides (see gingerbread man and cardinal above). You could also embellish a pretty bird or felt stars with beads. If you are a paper crafter, you could make a little wintery house or a pretty tree. If you are a photographer, you could mount a mini scene onto cardstock and frame with rick-rack or ribbons or yarn. Feel free to include a little something special, whether that is stationary, a notepad, sewing notions, a pincushion, a piece of fabric, some favorite recipes, some candies, tea light candles, whatever you think your partner might fancy (examples pictured above). You can definitely include a store bought item or a handmade item. Think of something you might like to receive. Send me an email to tadawilhelm [at] hotmail [dot] com with your mailing address (and your blog address, if you have one, so your partner can get to know you). Let me know if you are opposed to sending your ornament internationally. Otherwise, I will put everyone in one group and draw partners. I will try my very best to email your partner name within a week after the swap closes. Your partner won’t know you have their name, and you won’t know who has your name until you receive your ornament in the mail. Sign-ups will close Sunday, July 4. I hope to send your partner’s info to you by Saturday, July 10. That should give you about three weeks to make your ornament and send it to your partner, along with a little something special. Hi Terri! I would love to participate, but I don’t have a blog, which means I would not be able to post pictures of my partner’s darling (I just know it!) ornament. I”m wondering how much this matters. Doing this in July is so darn smart; I’m planning to continue the holiday sewing for the rest of the year! Thank you for doing all the work!! Thanks for the ornament ideas! I was thinking the same thing, I don’t have a blog either. I guess it depends how many people sign up, but maybe a “flicker” ornament swap group?? Kind of like the “Siggy” group that’s wrapping up with their second block exchange. When we receive our “lovelies” we can share our partners goodies and comments for all to see on the group site. It’s kind of like Christmas…watching everyone open their gifts! Heh heh! Hmmm I wonder if I can bring my sewing machine camping??? (Ohhh that’s a good question. “Where have you taken your sewing machine, well besides classes, to sew with?” Ha! Thanks for the ideas and count me in for the exchange! I’m in for the swap. I have been thinking of ideas since you blogged you wanted to have a swap. I would be willing to have an international partner. Swaps are so much fun!! I’m glad you are setting up a flickr group, because I like to see what everyone makes. YAY Terri!! I’m so excited! I am signing up for the swap then! This will be great fun. I will be away for the 4th of July weekend, but you can be sure I’ll be planning, maybe even creating out by the lake at my sister’s cabin. I will e-mail you with the info that you need to exchange with my partner. Thank you for arranging this. Hey Terri — I was planning to do this, but now that my friends have left town and I’m beginning to evaluate my July, it’s already looking a bit out of control. I’m afraid I’m going to have to pass. Have fun! Hi Terri, I would love to join you, but I have a very busy July planned with friends coming from out of state. Would we be mailing the ornaments the last week of July or before? Thanks for the info. I am so glad that I went looking for the swap! My feeds don’t seem to be loading right! Please add me to your list for the swap! How in the world did I miss this?! I was waiting and waiting for the sign up and somehow completely missed it. Agh. Guess I’ll be making ornaments early for Christmas 😉 Have fun everyone! My swap package went into the mail today. It may take a while to get where it’s going! The postman thought at least a week.